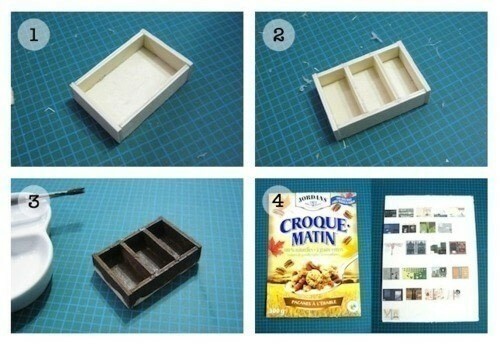 This craft came about with an empty crate that was used to hold clementines and my love for miniatures. 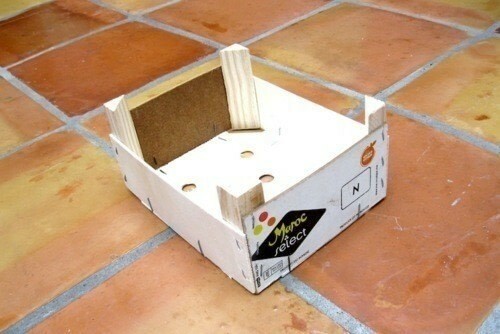 The first thing you need to do is to find some scrap wood. I actually thought about making this bookcase after eating all my clementines and wondering what to do with the leftover box. You can probably find some wood from Home Depot or any home renovation stores - the downside is they come in large sheets so you’ll only use up a tiny portion of it. Next step is cutting out all the pieces for your bookcase. I used an exacto knife and metal ruler to help me cut every piece out since the wood was pretty thin. If your wood is harder, you'll probably need a small saw. The pieces that are the same colour in the diagram should be the same size. 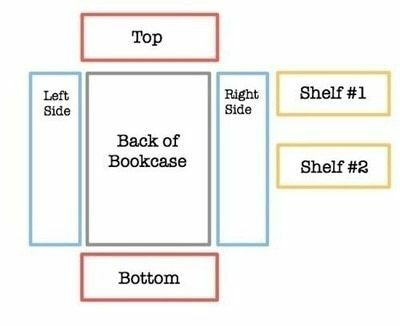 Notice how the top & bottom pieces are wider than the back of the bookcase - this is to make sure that you cover not only the edge of the back but also the side pieces. However much wider they are depends on the thickness of the wood - take the thickness, multiply that by two & add it on to the width of the back piece to get the width of your top & bottom pieces. I added two shelves to my bookcase, but feel free to do more (or less). I cut them slightly narrower than the bookcase back to allow room for glue later. I used a glue gun to glue all my pieces together - I tried super glue first but that failed. 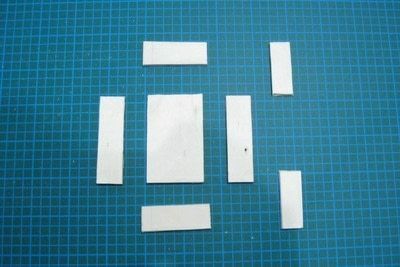 I’m sure you can use other adhesives as well - wood glue is probably the best choice. After assembling all your pieces together, you can paint it. I mixed some brown, black, and gold paint but you can paint it any colour you'd like - grey with red polkadots perhaps? That fourth picture shows the "card stock" that I printed my book covers on - I just finished eating a box of that cereal so it was a handy reuse. At this point you’ll need to go online, Google “book jackets” or “book covers” and download those images to use. I’m not sure exactly how copyright works here, but I wouldn’t recommend using those covers for a commercial purpose - i.e. selling. Then you can insert the book cover pictures into a word document, and resize them all - make sure their heights are shorter than the shelf space you’ve created. The ruler tool in MS Word is super useful here. 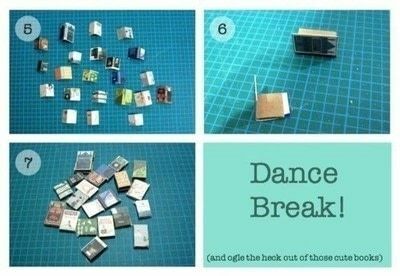 Once you print out all your book covers, it’s time to cut them out and assemble them into mini books. I used a thin piece of cardboard and my trusty glue gun to emulate the pages within the books - if the book is thicker, I just stacked the cardboard pieces on top of each other until it reached the right thickness. Don't forget the all-crucial dance break before you go on to the next step! 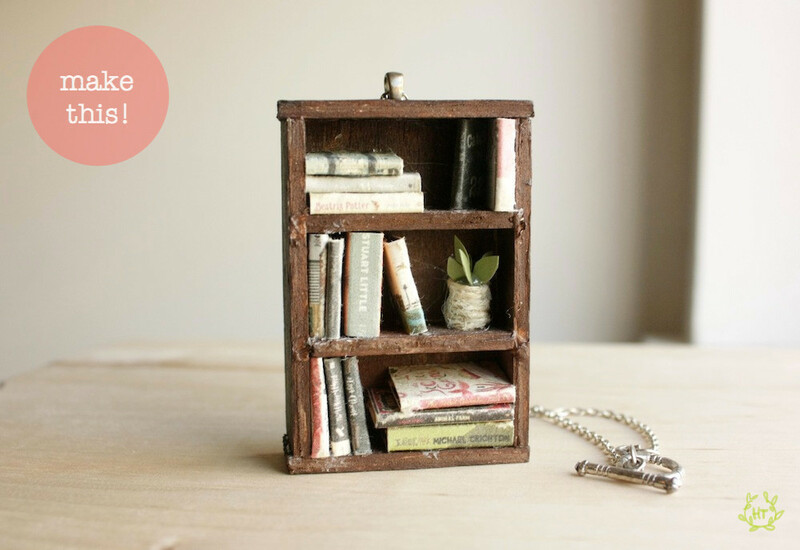 Once you have all your books ready, it’s time to put them into your bookshelf. You can arrange all the pieces first before gluing them down, or just go free form like I did. You can see that I left a little space on the 2nd shelf - this was for my little tchochke! I made a tiny vase with leaves out of hemp & paper & my hot glue gun, but other things like small game pieces (don’t take it from a working game though!) can be used as well. 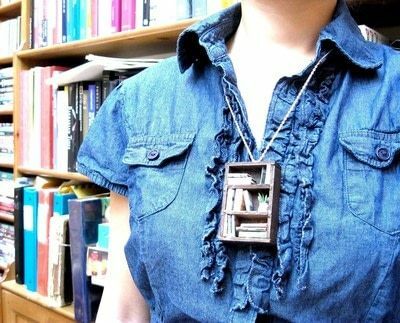 The final step is just gluing on a necklace bail at the back of the bookcase, and attach it to the silver necklace chain. 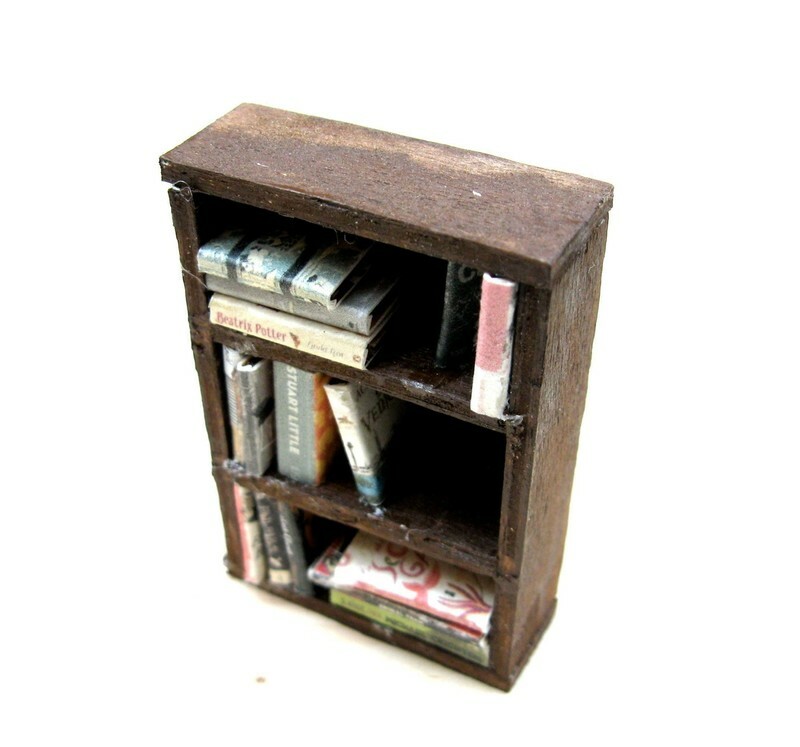 I left those materials as optional though because this could be left as is, and would function quite nicely in a miniature house.